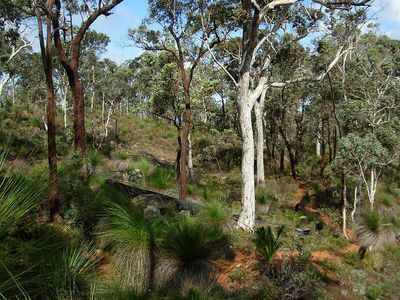 Small in size but rugged in terrain, the Darling Ranges are situated to the east of Perth, dividing the Swan coastal plains from the wide, sparsely-populated Wheatbelt region. Situated throughout the ranges are several national parks and nature reserves which provide protection for the area's unique flora and fauna, and a refreshing haven for nature-lovers desiring to escape the chaos and noise of city life. Beelu National Park. Image is from Wikimedia Commons (by SatuSuro). 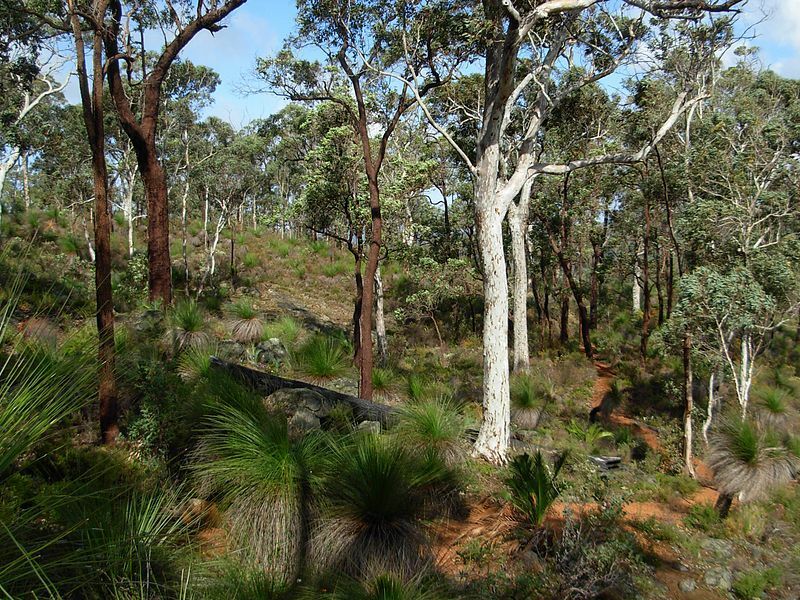 Formerly known as Mundaring National Park, the Beelu National Park is one of largest and most established national parks in the ranges, encompassing a vast 3000 hectares. Less than an hour's drive from Perth's CBD, the park is an ideal getaway. Whether you just want to spend a day in the bush or several, there is much to see and do for people of all ages and inclinations. One of the Beelu National Park's most popular spots, the Department of Environment and Conservation's Perth Hills Discovery Centre is where the Nearer To Nature team conducts exciting and informative activities aimed at increasing environmental awareness in the wider community. Although most of these activities are especially for children, several are for the whole family, and a few for adults only. Follow the sign to the Perth Hills Discovery Centre! My family and I have participated in quite a few of these over the years and can strongly recommend them to others. Children absolutely love the well-planned programs there which generally include a fun introduction to some aspect of the natural world (such as native animals or environmental issues) and a craft activity. Even if you aren't booked in for a nature activity, the Perth Hills Discovery Centre is a lovely spot to dally at, have a chat with the friendly staff and browse through the small kiosk and gift shop, where you can get maps and tourist information, purchase refreshments and admire local arts and crafts. The centre is based in several historic wooden cottages arranged around attractively landscaped native gardens, and surrounded by the bush. It's a terrific spot for a picnic and there are a few tables and benches situated in the gardens. 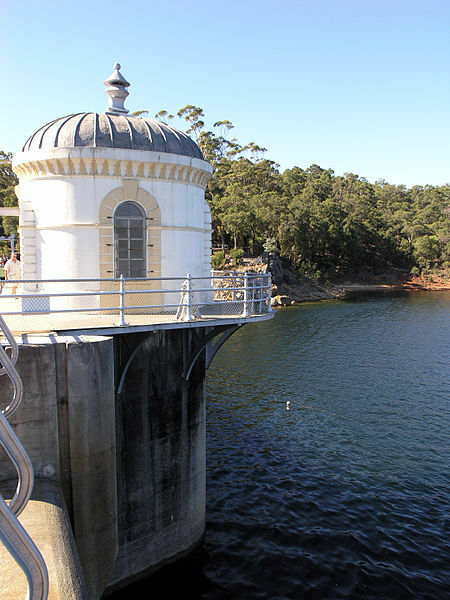 Also popular with visitors are the Mundaring Weir and beautiful Lake C.Y. O'Connor, named after the engineer who, in the late nineteenth century, designed this remarkable engineering feat and orchestrated the huge task of transporting water from the weir through a massive pipeline to the arid eastern goldfields, over 500 kilometres away. Mundaring Weir. Image from Wikimedia Commons (by SeanMack). 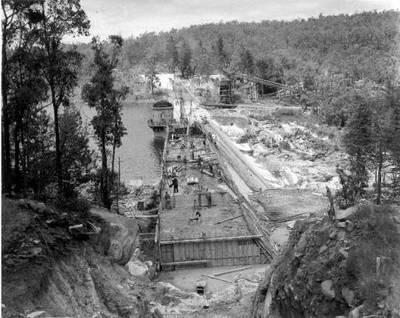 Mundaring Weir under construction. Image is from Wikimedia Commons (originally from the Golden Pipeline website). History buffs will enjoy visiting No. 1 Pumping Station, formerly known as C.Y. O'Connor Museum: a fascinating structure dating back to 1903 which stands at the foot of Mundaring Weir. It's also the starting point for the Golden Pipeline Heritage Trail, which offers a range of walk and cycle routes around the weir. No. 1 Pump Station is open on Saturdays and Sundays (except Christmas day and Good Friday), from midday until 4.00pm. No. 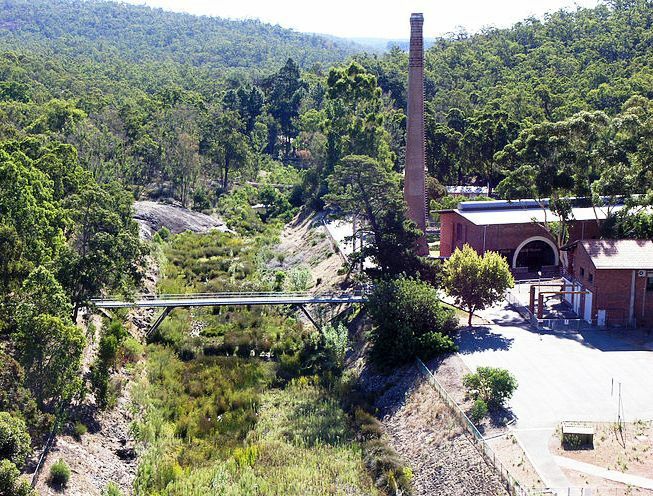 1 Pumping Station, Mundaring Weir. Image from Wikimedia Commons (by SeanMack). In another heritage-listed building across the road from the beautiful old Mundaring Weir Hotel is the Mundaring Weir Gallery, where a wide range of exquisite creations by local artisans can be admired and purchased. It's a great spot to pick up some beautiful, handmade gifts and is open Fridays, Saturdays, Sundays and public holidays from 11.30am until 5.00pm. The Mundaring Weir Art Gallery. The Beelu National Park is a picnicker's paradise and there are heaps of beaut spots to choose from. While the gardens of the Perth Hills Discover Centre are lovely, further up Mundaring Weir Road are the picturesque Mundaring Weir Gardens, which boast many well-appointed picnic tables, quite a few which have shelters over them. This is a truly gorgeous spot, with all the facilities one needs for a big day out. In addition, the views are priceless and in the afternoon many kangaroos and wallabies can be seen lazing around the gardens. Other picnic areas with views over the weir are North Ledge and South Ledge, also on Mundaring Weir Road. 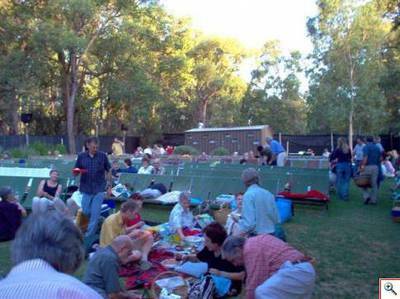 The picnic area at the Perth Hills Discovery Centre. Another lovely spot is the Fred Jacoby Park, where you can see many trees and plants from all around the world, including one of the largest oak trees in Western Australia. There are plenty of great picnic places here and free gas barbecues. Please note, however, that the park will be temporarily closed until February 2013, due to extensive works in the area. Smaller, less known picnic nooks can be found at several sites along the Mundaring Weir Road, including Pimelia, Grevillea and The Dell. Look out for sign posts as you drive along. 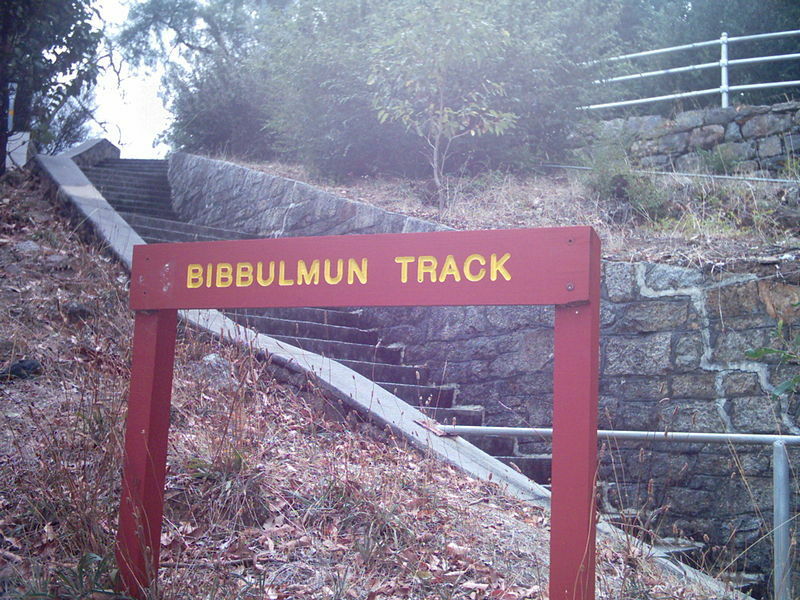 The Beelu National Park is extremely popular with bushwalkers, and there are many terrific walking trails catering for all ages and levels of fitness. 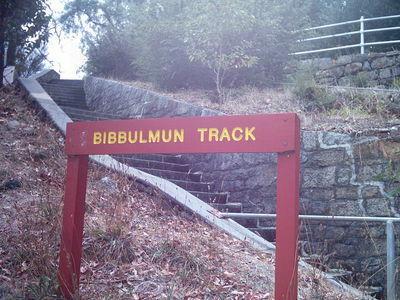 The most famous of these trails is the Bibbulman Track, which begins in nearby Kalamunda and meanders its way 960 kilometres south to Albany. Of course, it's possible to do shorter stretches, too, and the section which passes through the Perth Hills Discovery Centre is absolutely gorgeous. Also popular, the 1.9 kilometre long Weir Walk gives visitors the chance to have a close look at the remarkable Mundaring Weir, and begins at the No. 1 Pump Station. Visit the Perth Hills Discovery Centre or the No. 1 Pump Station for more information about all the walking trails in the national park. Bushwalking in the Perth Hills is especially pleasant after the spring rains when many varieties of native wildflowers are blooming. For a great night out, why not head for the Kookaburra Outdoor Cinema which is located right next to the Perth Hills Discovery Centre? With the beautiful weather we enjoy in Perth, watching a movie under the stars is a popular pastime during the summers months. To find out more, have a look at their website. Patrons enjoying a picnic at the Kookaburra Outdoor Cinema before the movies begin. Image is from the Kookaburra Outdoor Cinema website. Have you enjoyed your day at the Beelu National Park so much that you don't want to go home? Well, you wouldn't be the first person to feel that way. Fortunately, it's possible to stay overnight in the park, and there are several different accommodation options to choose from. Those who love camping will be pleased to know that there's a small 'luxury' camping ground situated right next to the Perth Hills Discovery Centre. For a very reasonable price, it's possible to pitch a tent in one of just twelve sites, surrounded by the native forest and the local wildlife. The amenities are spotless and comfortably rustic, including a very nice camp kitchen. Being so close to the city and with so much to do close by, this is a top spot to introduce young children to the joys of sleeping under the stars. To book your weekend camping getaway online, go to this website. The camping area at the Perth Hills Discovery Centre. If camping isn't really your thing, another overnight option is to stay at the historic Mundaring Weir Hotel, located just a stone's throw from the weir. While the old hotel building where C.Y. O'Connor himself used to stay is no longer used for guest accommodation, there are ten well equipped motel-style units tucked away in the gardens, each with fireplace. The accommodation units at the Mundaring Weir Hotel. Image is from the Mundaring Weir Hotel website. Another delightful option right in the heart of the national park is the Lavendar Patch Bed and Breakfast which can cater for up to six adults in three beautiful and very comfortable rooms, two with ensuite bathrooms and the other with its own bathroom just across the hall. Whether you spend just a few hours or several days at the Beelu National Park, time spent at this magical place is an experience which will be sure to linger on in your heart and mind forever. Why? The Beelu National Park is a beautiful natural oasis, less than hour from Perth. When: Any time throughout the year. Where: Mundaring Weir Road, Mundaring, Western Australia, 6073.